Hull City manager Nigel Adkins. 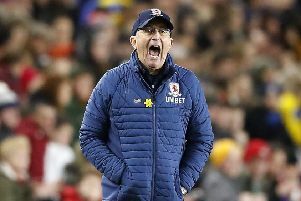 Hull City manager Nigel Adkins could not believe his team left Middlesbrough pointless after a couple of big incidents in their 1-0 defeat at the Riverside Stadium. The Tigers lost courtesy of Britt Assombalonga’s 25th-minute tap-in from Ashley Fletcher’s low cross into the area and there were numerous chances at both ends to add to the scoreline. But some big misses and a stunning late save from Middlesbrough goalkeeper Darren Randolph, when he tipped Kamil Grosicki’s stoppage-time free-kick against the crossbar, ensured the scoreline stayed the same. Adkins also felt Hull should have had a second-half penalty when Jonny Howson appeared to pull Frazier Campbell when he looked to get on the end of Jackson Irvine’s delivery. Adkins, whose side are five points behind sixth spot, said: “How have we not won the game? We played well for 20 minutes in the first half and we had good opportunities in the first half, loads of opportunities in the second half. “I think the referee [Robert Jones] is going to go to the top of his game but how he has not given the penalty, he has to give it. “And you can see why Randolph is in the team of the year, he got a fingernail to push it on to the bar and it’s a fantastic save. We have tried everything we can to win a game of football. “Fraizer had a tap-in. Howson came from behind, totally pulled him and unbalanced him. “How can he not give that, how the four officials can’t give that? I can’t fault the players, we have had a go, kept going forward, we were adventurous going forward. “We need to win every game going forward, we have to keep working through the process, and see if we can put ourselves in a position. Assombalonga was in the right place to turn in Fletcher’s low cross with 25 minutes on the clock and that was how it stayed at a nervy Riverside. Hull, who had won their previous three games, enjoyed far too much freedom down the flanks and Grosicki and Jarrod Bowen looked to make the most of the space. Grosicki had the best early chance when he rolled an effort to goalkeeper Darren Randolph. Defender Aden Flint headed wide from Howson’s corner seconds before the opening goal. Ryan Shotton played Fletcher in down the right and his delivery was turned over the line from close range by Assombalonga. After the break Hull, Campbell headed wide from close range. Middlesbrough: Randolph, Ayala (Clayton 61), Flint, Fry, Shotton, Howson, Mikel, Besic (Downing 79), Saville, Assombalonga, Fletcher (Tavernier 80). Unused substitutes: Konstantopoulos, Hugill, McNair, Gestede. Hull: Marshall, Kane (Evandro 77), Burke, De Wijs (Batty 87), Lichaj, Bowen, Henriksen, Irvine, Grosicki, Pugh (Martin 65), Campbell. Unused substitutes: Stewart, Long, McKenzie, Ridgewell.